Click on the play button for short video. Affordable home improvements are just a phone call away! 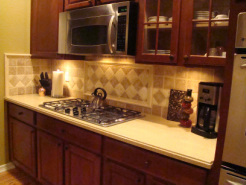 Have you ever wanted to make some improvements in your home or do a complete remodel? Do you have an unfinished project or basement? A to‐do list that isn't getting done? We are your affordable solution! Your home is considered by many to be your castle, your sanctuary. Why not take one room at a time and make it the way you always wanted? At Keystone, we can make this a reality for you! Whether you need a kitchen or bath re-model, new tile floor or back splash, re-modeling of one room, a newly finished basement, or a whole house makeover, we can help you! We work with the best tradesmen in the industry to take your dreams and visions and turn them into a beautiful reality! Do you need a meticulous, professional ? Gregory Danyow grew up in Vermont. His father, an entrepreneur at heart, owned a dairy farm and a lumber mill. At a young age, Gregory learned all about hard work and doing things for yourself. As a teenager he helped build his first home. Following in his fathers footsteps, as a young entrepreneur, Gregory owned his first business as a flooring installer at the age of 20. To escape some of those long, hard winters in Vermont, Gregory moved to Las Vegas. In Vegas. There he did many fix and flip type projects. It was also in Las Vegas he honed his skills in tile and stone with his best friend, and mentor Phil Roldan, a marble mason. In 2004 Gregory and his family decided to move to Colorado which they now call home. Gregory has done everything from being a laborer in hotel construction to a finish carpenter. If you are looking for someone that takes pride in their work, is a perfectionist and will treat you right every time, you found him!
" My goal, as always, is to meet or exceed your expectations. I love what I do and and take pride in the fact that you will enjoy the finished product for years and years to come." Please feel free to watch my video above and look at the pictures on my website. You can also click here, or on the icons at the top right of the page, to go to my Facebook or Linked-In profile. On Facebook you can see more pictures and a step-by-step process of building a custom shower.